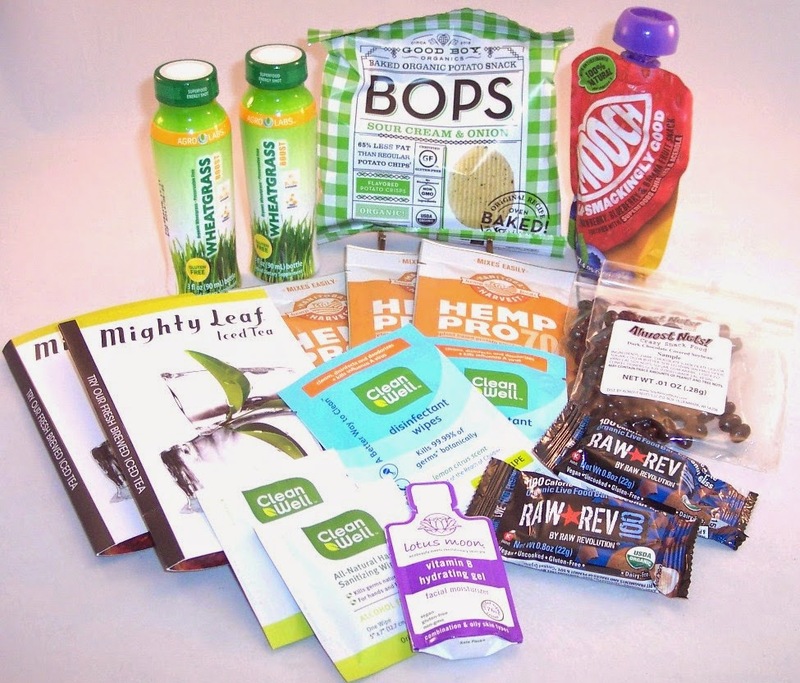 Bestowed Healthy Snack Box June 2014 Review + $9.00 Discount Code! The definition of the word "bestow" according to Random House is a) to present as a gift or prize; give or confer b) to put to some use; apply, c) to house; provide quarters for or d) to put, stow, deposit or store. 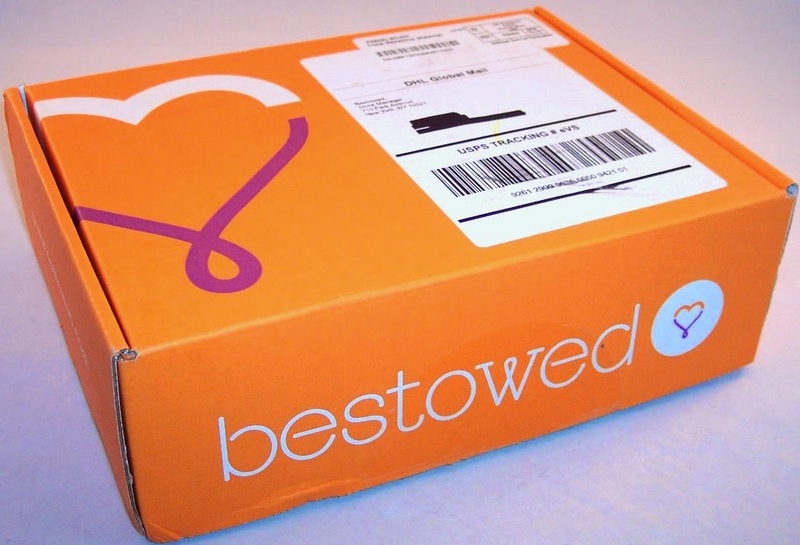 "Bestowed" is the name of a subscription box company and shopping site that specializes in healthy snacks, foods and beverages. It's a rather odd name but I think definitions (a) and (b) above apply, at least in part. Bestowed was founded by Heather Bauer, a Registered Dietician and nationally recognized nutrition expert whose mission is to teach us better eating habits. The site provides lots of tips, advice and recipes as well as being a place to shop for all sorts of healthy foods. They also have a monthly subscription service which is $19 per month or $209 per year.With the annual plan, you essentially get one month for free. Shipping is free and you can cancel at any time. In May, Living Social had a three month subscription deal for Bestowed. At $19 per month, Bestowed is a very good buy; at $37 for three months, the deal was irresistible! Once I signed up, I had a LONG wait...six weeks to be exact. I was supposed to receive the May box within two weeks of signing up but it took a very long route and didn't reach me until June 20th. Three days later, the June box showed up. It was frustrating to receive so much stuff at once and lose the benefit of having the boxes spaced out a month apart but I have to say, the Customer Service person who helped me track down the missing May box stayed right with me until it showed up. Communication makes all the difference when something goes wrong! So...on to the bright orange box. Since I received two months' worth of boxes so close together, I'll just review the June box in this post. For the price paid, I was surprised that the Bestowed box weighed almost two pounds and contained 18 items! There were duplicates of several items and even a triplicate of one. A brochure was enclosed which contains a note from Ms. Bauer and descriptions of all the items in the box along with tips on how and when to use them. First are two 3 oz. 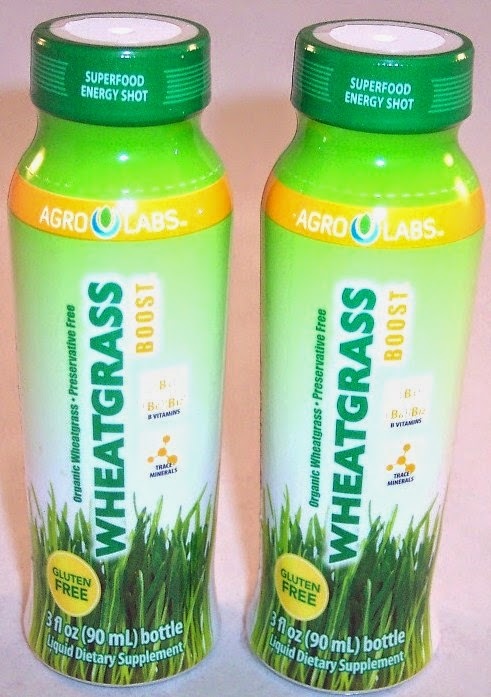 bottles of Wheatgrass Boost from Agro Labs. This is a superfood energy shot that provides a nutritious way to get your energy boost without any kind of crash. Next are two packages, each containing one wet disinfectant wipe from Clean Well. 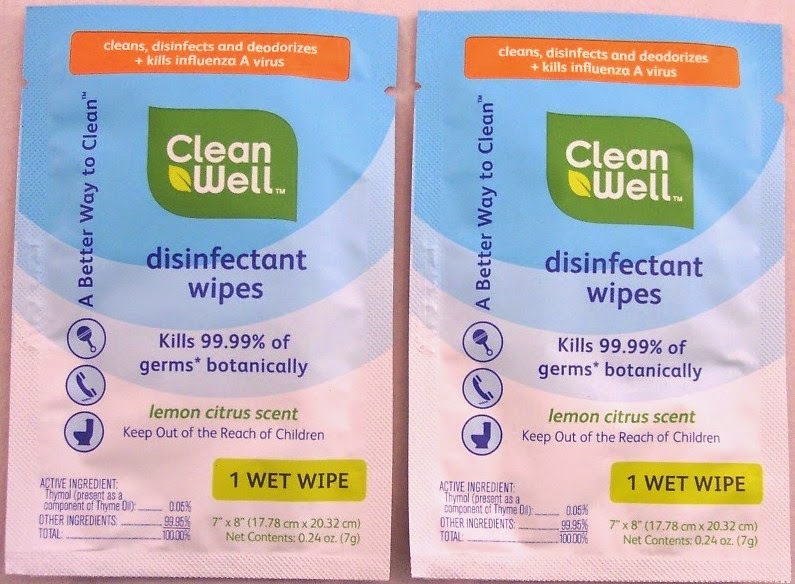 These are in the lemon citrus scent and kill 99.99% of germs botanically. 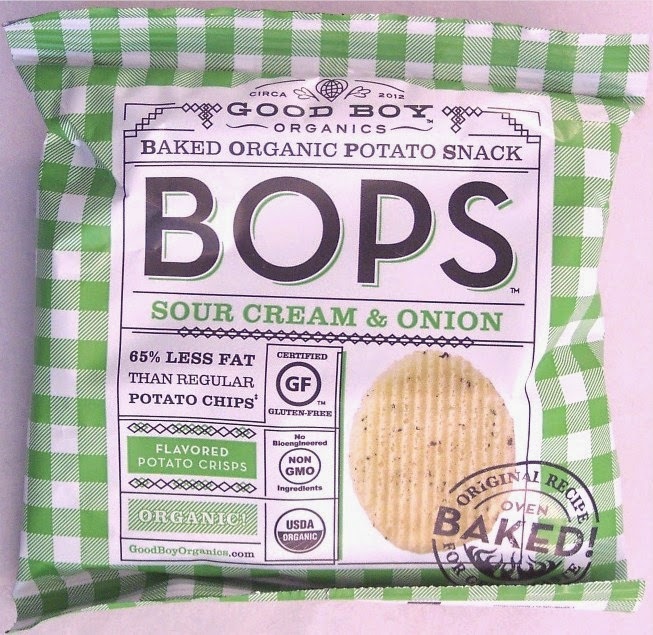 There is a package of BOPS Sour Cream & Onion baked organic potato snacks from Good Boy Organics.These are baked (not fried) and have 65% less fat than regular potato chips. They are also additive and preservative free. 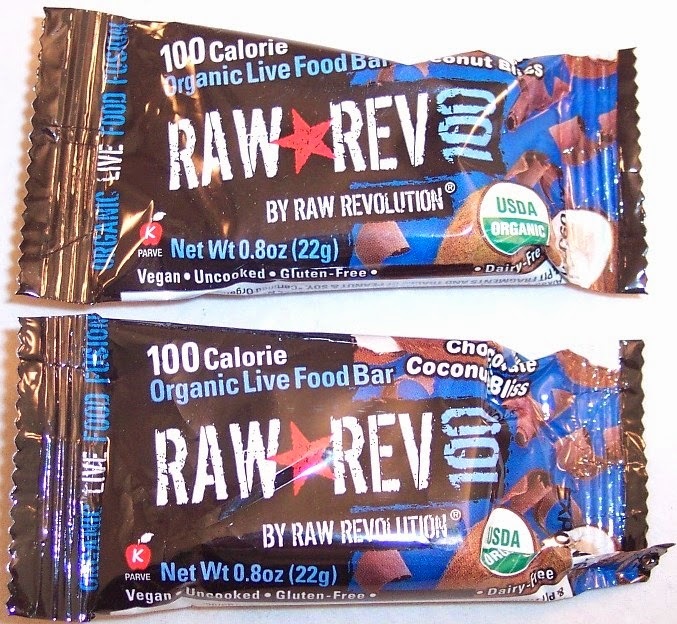 There are two powerful looking little 100 calorie organic live food bars by Raw Revolution. I'm wary about consuming any food that has "live" in the description but the "Chocolate Coconut Bliss" flavor eases my mind considerably. There are only a couple of single items in this box. One of them is a small hydrating gel sample from Lotus Moon. 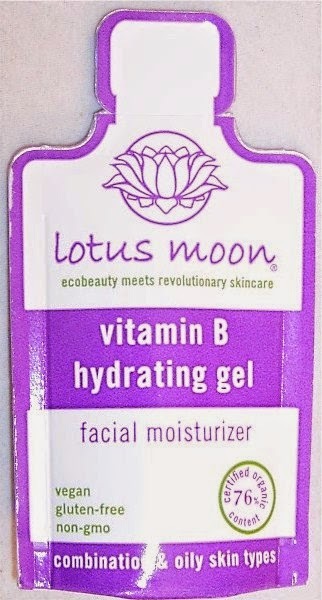 This is a vegan, gluten-free, non-GMO facial moisturizer. 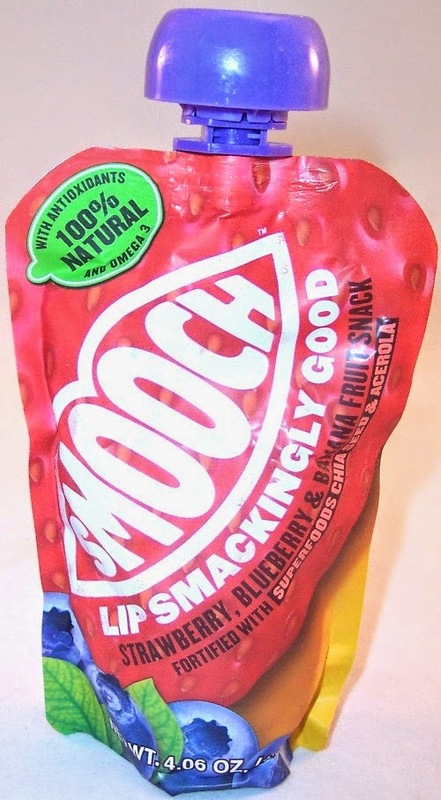 The other "single" in this box is a pouch from Smooch containing a fruit puree made of strawberries, blueberries and bananas fortified with chia seeds and acerola. This is considered another "superfood" since it is low in calories, high in fiber, delicious and convenient. This pouch is a little beat up but still completely intact. 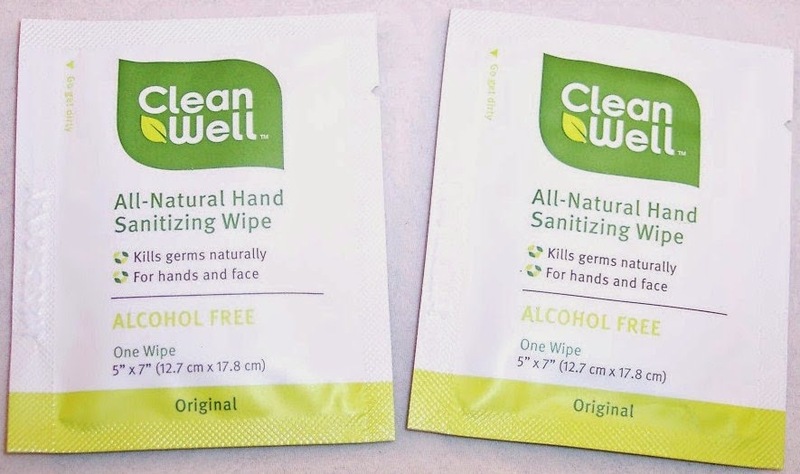 Another cleaning product is a pair of all-natural hand sanitizing wipes, again from Clean Well. These are alcohol free and good for sensitive skin. I have saved my two favorite products in this box for last. 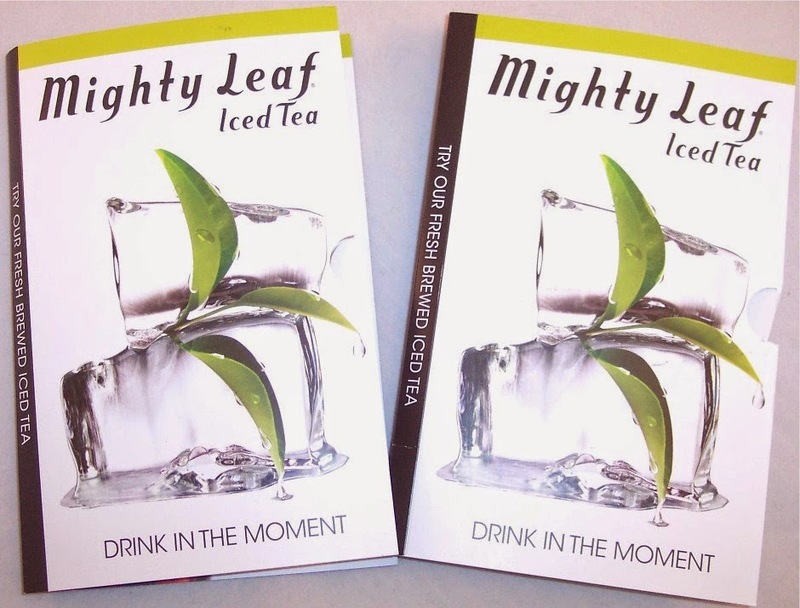 The first is two generous size tea bags of Mighty Leaf Iced Tea, in the delicious sounding flavor "Calypso Mango". This is a black tea that contains a blend of mangoes and tropical fruit. I love fruit flavored black teas so this is right up my alley. Each folder also contains a $1.50 coupon. 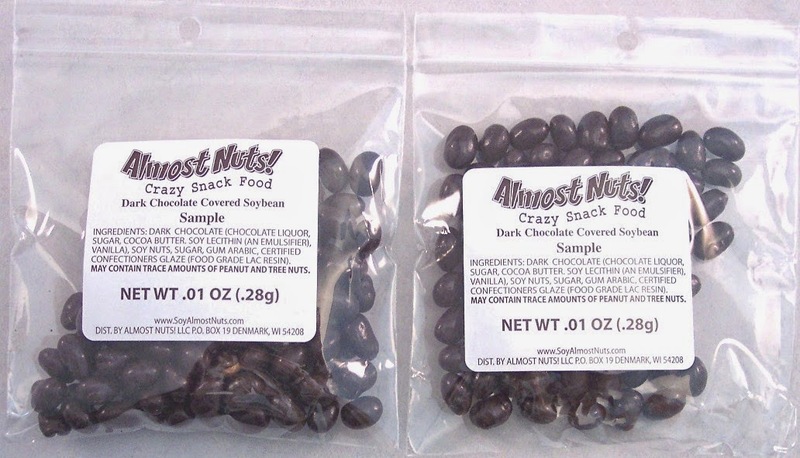 The last two items are packages of Dark Chocolate Covered Soybeans from Almost Nuts. I often don't like soybeans in other forms but the ratio of dark chocolate to bean in these is strong enough to make them really good. This is definitely a product I would consider buying in a larger size. As you can see, there is a lot in this box. Much of it is new to me but the low price makes it painless to learn about and convenient to sample some healthy new snack options. Unlike a lot of other subscription box websites, Bestowed also has a big selection of items for individual purchase. These are arranged in categories so you can go right to the section that interests you. If you'd like to try Bestowed's subscription box, click here and use the code FIRST for a $9.00 discount on your first box. Bestowed boxes definitely give you high product value for the price paid. Even if you don't like a few of the things, you'll still get your money's worth! If I had to award a prize to the sub box company that sent the BEST packaging for the past year, it would go hands down to Glossybox for their June "Stars & Stripes Edition" box! Glossybox always sends their products in a beautiful gift-quality box but the red, white and blue design of the June box surpassed all previous boxes as far as I'm concerned. Outstanding job Glossybox! Inside is just as colorfully patriotic with four luxury size products and one full size product nestled in a bed of red crinkle shreds. 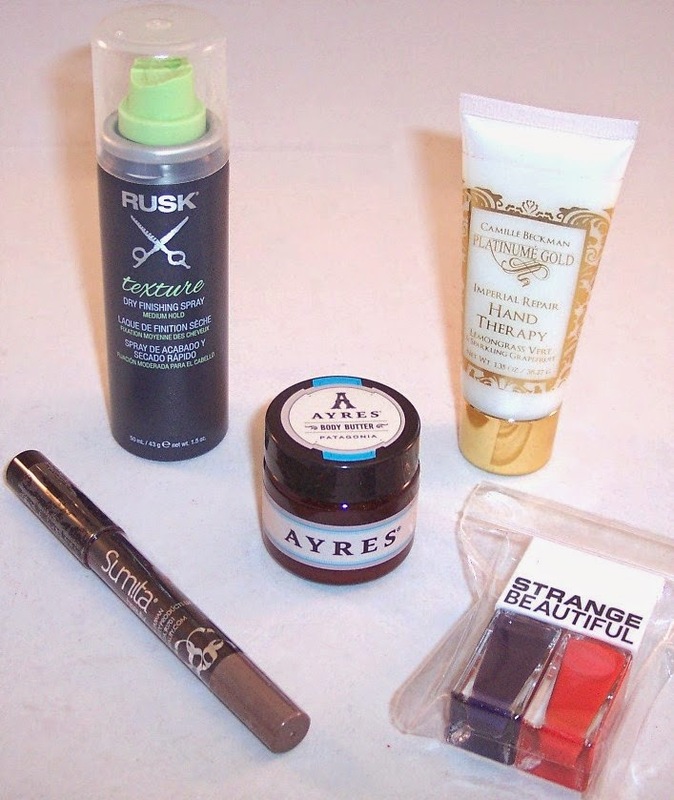 This box includes a nicely curated assortment of high end brands for the nails, hands, eyes, hair and body. In addition to the explanatory card that tells about the products, there is also a discount card to be used at any C. Wonder store or on their site. The exact amount is a secret until you check out but can be worth up to $500. C. Wonder is new to me but it looks like a fun shopping site full of cool clothing, accessories and home goods. Alas, my card was worth only $5.00 at checkout. However, there are several eBates deals available for C. Wonder that really improve on the overall deal. 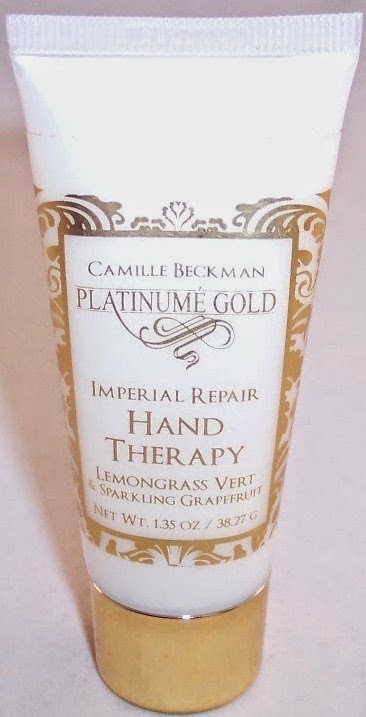 The first item in the box is Platinume Gold Imperial Repair Hand Therapy by Camille Beckman. This hydrates, restores and softens your hands. It has a light citrus scent and includes botanicals like sweet almond oil, grapeseed oil and the brand's signature herbal complex. Full size retail $10. 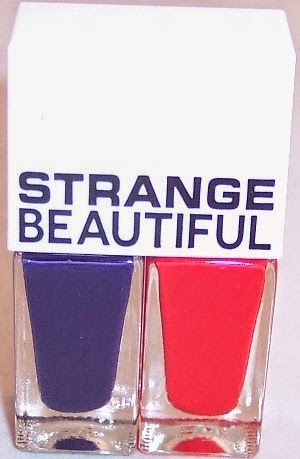 One of the buzzed about spoilers for this box was the stunning StrangeBeautiful navy and red nail lacquer duo called Colorbloc. This patriotic pairing was designed exclusively for Glossybox and is especially nice for travel due to its compact size. Full size retail $18. Next is a full size chunky eye shadow pencil by Sumita Beauty in a gorgeous champagne color. 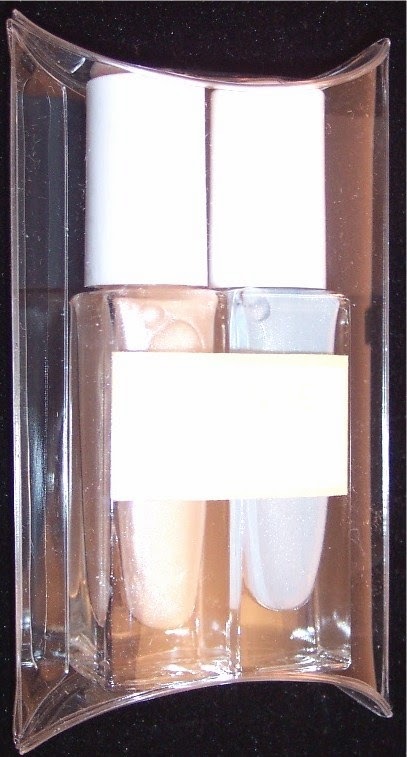 This universally flattering golden shade with a hint of shimmer can be used as a highlight or to color the entire lid. This goes on with silky smooth application and won't smudge or smear. Full size retail $18. There is a Texture Dry Finishing Spray by Rusk. This talc-free (no white flakes) dry hair styling spray that gives an instant boost by adding texture and shape. Full size retail $18. 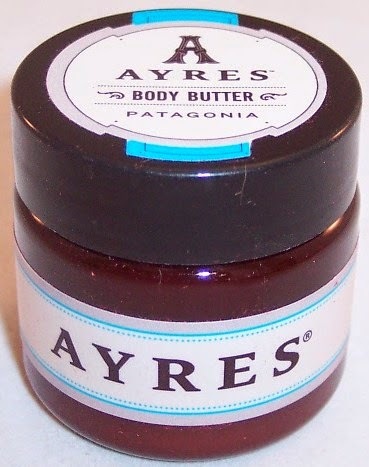 Last we have Patagonia Body Butter from Ayres. This all-natural body formula has a very light herbal scent composed of jasmine, rosemary, lavender, bergamot and fir essential oils. Full size retail $28. As nice as these products are I'm still completely wowed by the box! They could have included just about anything and I would have been a happy camper. All these luxury samples are icing on the cake as far as I'm concerned. Presentation matters and Glossybox, more than anybody else, gets that! This box is still available for $21.00. If you're interested, click here. 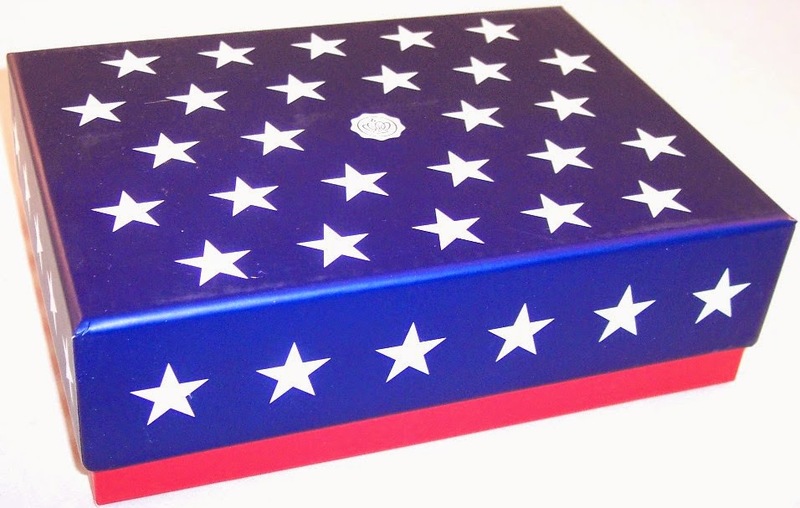 Since they've already come out with a couple of July spoilers, I'm not sure how much longer the Stars & Stripes Edition box will be on their site. Grab it soon, if you're so inclined! If you sign up for Glossybox, use the code HAIR at checkout to get a free Nioxin Diamax Hair Thickener, a $50 value. Also, you can get $2.75 cash back if you sign in through eBates. Nibblr June 2014 Review + Referral Code for a FREE Box! It's been a while since I reviewed a Nibblr box. Guess I've been too busy munching away! Nibblr is a snack service that sends a slim box containing four portion controlled trays containing delicious healthy snacks...sweet, salty, nutty and/or fruity. Each tray is sealed and removable so they are easy to take with you for on-the-go snacking. You can go on the site at any time and rate the snacks according to your own tastes, using a rating system of "Love It", "Like It", "Interested" or "No Thanks". If there is a particular ingredient you don't like, just put that word in the Search box and it will bring up every snack that contains that item...which you can then mark "No Thanks". There is also an option to choose only snacks that are under 150 calories. Although you can't choose the snacks for a particular shipment, Nibblr uses your ratings to customize your boxes. Nibblr lets you choose the frequency of your shipments. You can have them delivered every week, every other week or once a month. I have found that every other week delivery works perfectly for me. The Nibblr box is conveniently designed to fit in your mailbox and is 100% recyclable. The snack trays are fully labeled with nutrition information and expiration dates. From left to right, my first snack was "Not-So-Sticky Bun", a sweet, salty, nutty and crunchy snack containing tiny graham cookies, cinnamon praline almonds and slivered almonds. This one contains 6g fat. Next was "Punched Up Pistachios", pistachios that have been roasted and spiced up with salt and pepper, sugar, onion powder, garlic powder, lemon juice and a few other things. With 8g of fat for this tray, these are definitely not low fat! "The Sweet Life" is a fruity mix containing dried peaches, blueberry pomegranate pieces and golden raisins. With 0 fat grams, this is a sweet and completely guilt free treat! The last snack mix is called "Georgia on My Mind". I've had this one before and really love it. It's composed of dried peaches, blueberry pomegranate pieces and sweet and spicy pecan pieces. At 2.5g fat, this one is also fairly guilt free. As you rate snacks over time, the snacks you receive will more closely reflect your tastes. Since I've been subscribing and rating for about five months now, I rarely get anything I don't like. They routinely add new snacks and you can always go on the site and rate those as well. If you'd like to try Nibblr, you can get your first box free and with no obligation. To do that, you'll need a referral code. My referral code is 2745 if you want to take advantage of Nibblr's free box offer. Nibblr sends great tasty snacks and I'm guessing you'll want to sign up! 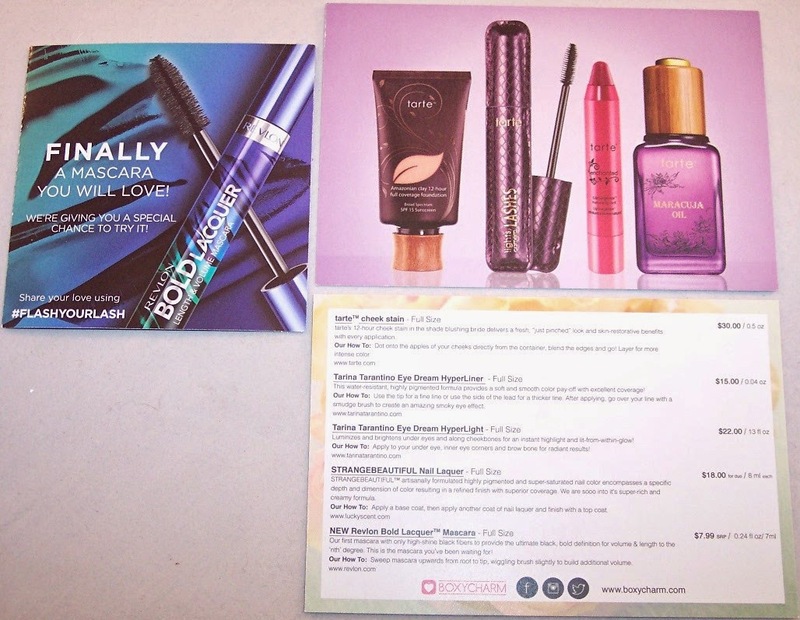 Once again, Boxycharm exceeded expectations with their June 2014 beauty box! Over the past few months, this company has consistently surprised me with the quality and value of products they send for the $21 monthly subscription fee. For June, the theme of their box was "Bridal Beauty" with five full size items that arrived in their new signature white box. 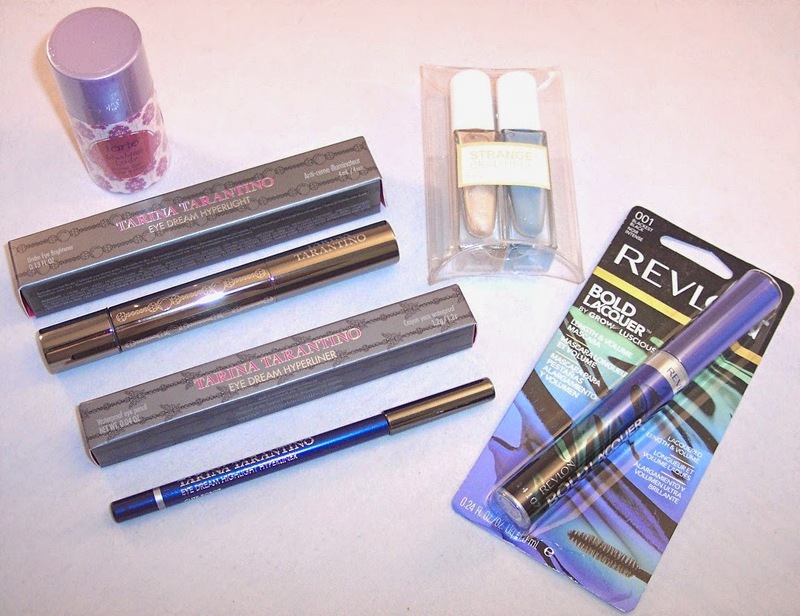 The brands included this month were Tarte, Tarina Tarantino, Revlon and StrangeBeautiful. At just $21.00, Boxycharm once again sent an incredible product value for the price paid. All of these products are full size and in shades that I think most women will really enjoy and use. In case you're interested, July's sneak peeks from Boxycharm include a full size Pur-Lisse Moisturizer and a lipstick from Appeal Cosmetics. That's a new one to me but the shades I've seen are really pretty. 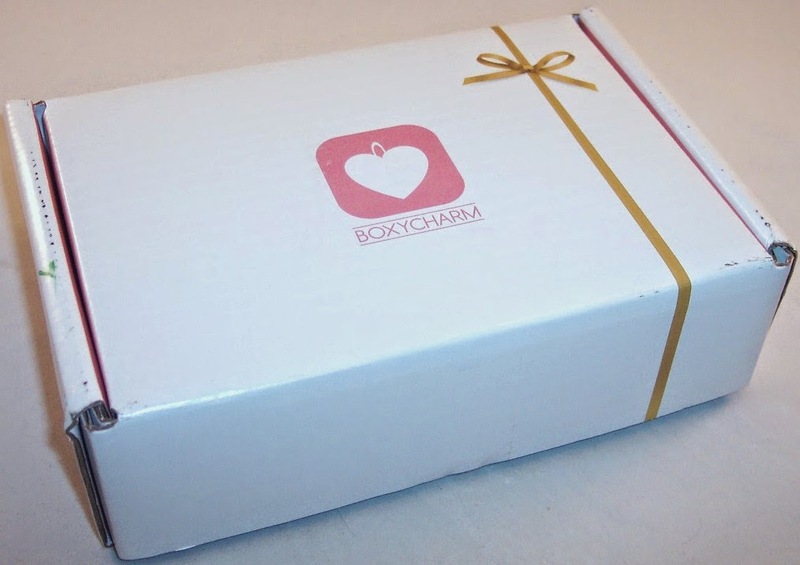 If you're interested in signing up for Boxycharm, click here. I don't think you'll find better value or quality in a beauty subscription box! Escape Monthly Vacation in a Box (Las Vegas) June 2014 Review + 20% Discount Code! What happens in Vegas stays in Vegas....unless you received an Escape Monthly box for June! In that case, a big box of souvenirs representing the best of Las Vegas arrived in your mailbox. 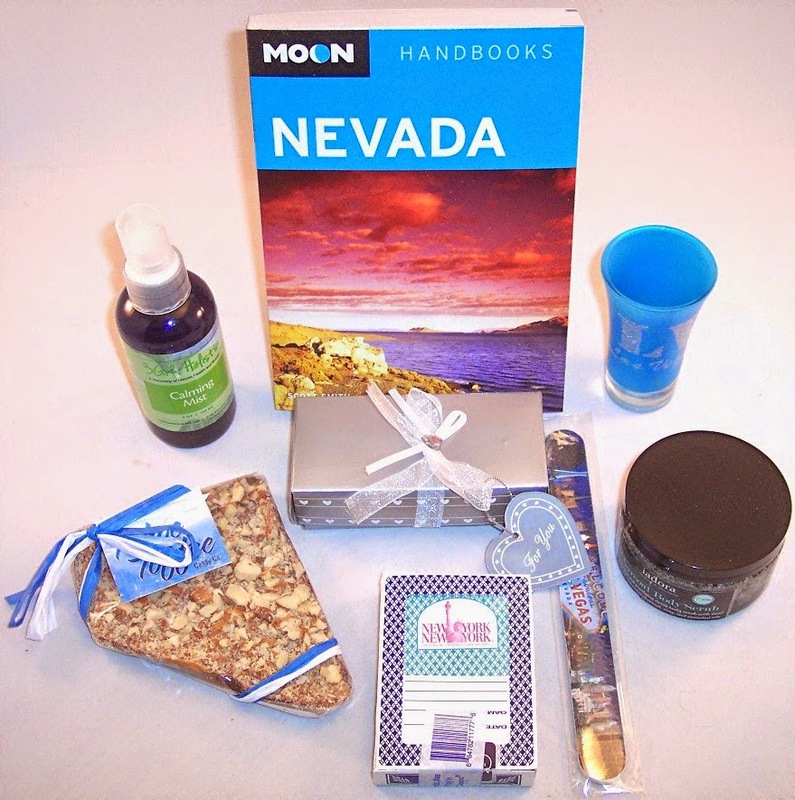 This month's box contained a lot of fun and unique items that represent the luxury nightlife, exotic spas and tasty treats for which Vegas is known. 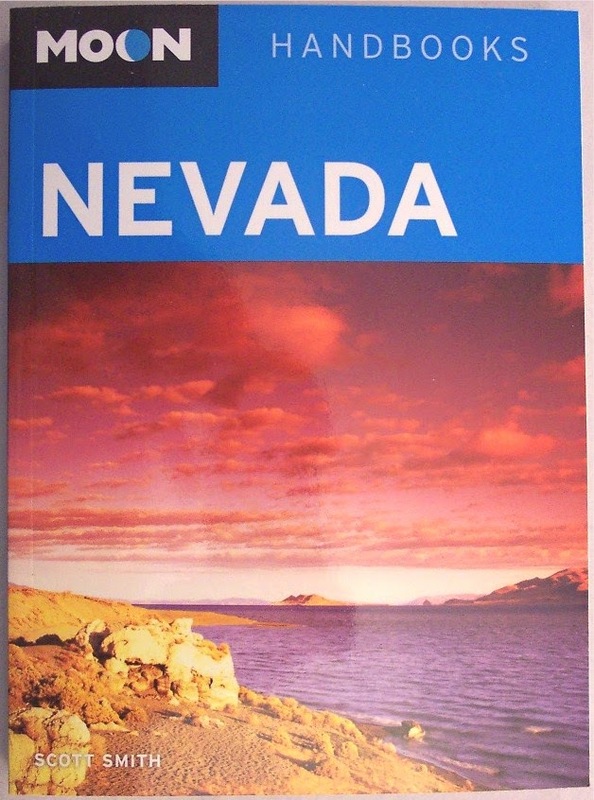 Our travel brochure provides product information, retail prices and fun facts about Vegas. Did you know "Las Vegas" is Spanish for "The Meadows" and that there is one slot machine for every 2.5 residents of Vegas? Every Escape Monthly box that I've received so far has contained a comprehensive Moon guide book for the area. These books contain all the information you need to plan a fabulous trip or just to do some leisurely armchair traveling. The retail price of these books is $19.99 so they constitute a significant part of the value of each box. Escape Monthly does offer a "mini box" that does not include the tour book and contains fewer products. I really enjoy my growing collection of Moon tour books though so don't think I'd switch to the mini box option. 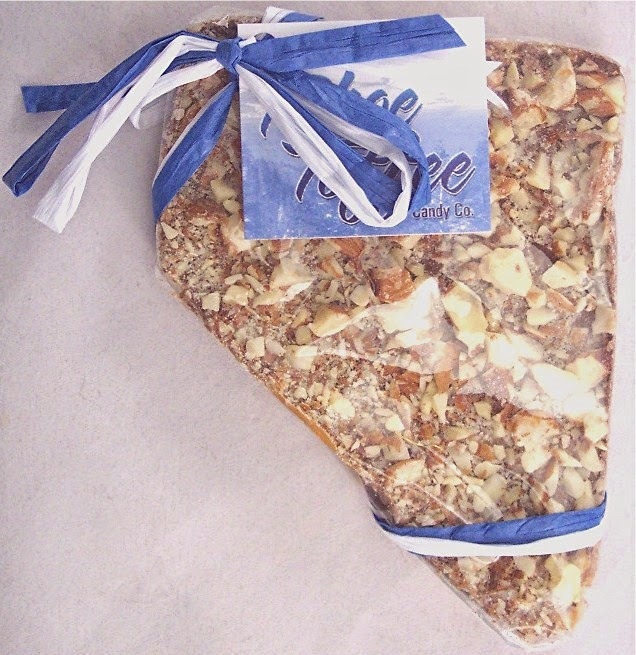 The first item out of the box was this luscious Nevada-shaped piece of toffee by Tahoe Toffee. Toffee, English or otherwise, is probably my favorite candy of all, so I'm delighted to get this. In a gift box, this retails for $12 but I see that it's on sale for 50% off on Escape Monthly's site right now. The price is only $6 with free shipping. Next is a 4 oz. bottle of "Calming Mist" spray by 3 Girls Holistic. It contains lavender, Roman chamomile, ylang ylang essential oils and vanilla. This spa product helps ease tension and stress with just a few spritzes. As you can see from the photo, my bottle leaked in shipment but only about half an inch of the liquid was lost. This calming mist is also on sale for half price ($6) on Escape Monthly's site. 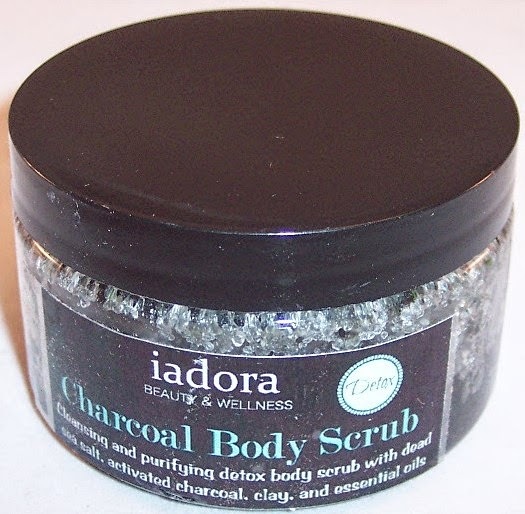 The other spa product in my box is a container of Charcoal Body Scrub by Iadora. This is a once a week cleanse and detox product that contains activated charcoal, clay and essential oils. Looks wicked! An emery board with a classic Vegas strip design featuring the famous "Welcome" sign was also included. Even though I don't drink, I think the coolest product in this box is a Vegas wine stopper that comes nestled in a satin covered cushion inside a box that's suitable for gift giving. The stopper is a sleek contemporary design with a see through Lucite (or glass?) die on top. Perfect addition to this box! Of course, a Vegas themed box wouldn't be complete without a shot glass. 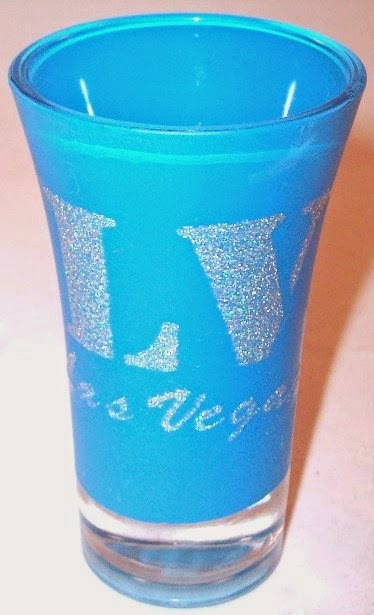 This one is blue with a big glittery silver "LV" and "Las Vegas" spelled out underneath. 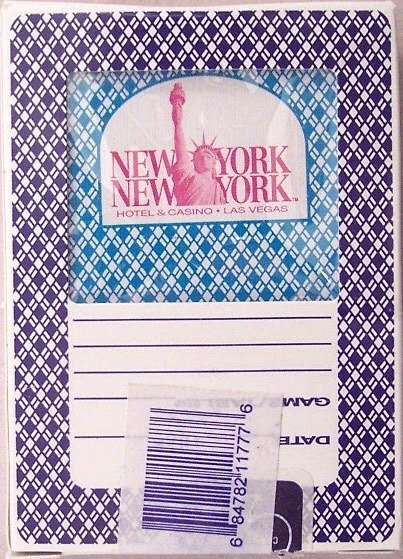 The final item is a box of authentic clipped casino playing cards from the New York, New York Hotel & Casino. These come straight from the casino and were actually used in live games, then were retired and clipped to avoid cheating. There may be a couple of items marked "Made in China" in this box but these are the REAL deal! I think Escape Monthly did an exceptionally good job of curation this month; they really captured the glitz and glamour of this iconic desert city. Now I'm ready to hop on a plane and get my Vegas on! Next month we are going to India! From the hints they've dropped, I'm guessing we'll see an exotic spice or two and some Ayurvedic spa treatments. Escape Monthly's July boxes will begin shipping on July 16th. Sign up now so you won't miss out. The regular price of an Escape Monthly box is $49.95 per month; however, 20% discounts are widely available. For now, use the code INDIAESCAPE to get 20% off the July box. The really nice thing about their discounts is that once you use one, you get that same discount for life. So essentially the cost of a box is $39.96 for as long as you subscribe. Did you get the June box? If so, what is your favorite item? For me, it's a toss-up between the toffee and the wine stopper. Yumvelope June 2014 Review + 20% Discount Code! Since eliminating snacks is out of the question (for me anyway), I've been keeping my eyes open for subscription boxes that provide healthy options. Of course, there is usually a trade-off...the more virtuous the claims, the worse the stuff tastes. If you're interested in improving the quality of your snacks but don't want to sacrifice flavor, you might consider checking out Yumvelope. I first reviewed Yumvelope in May and have especially fond memories of the wonderful Nina's Pecan Cherry Granola! If you missed that review and would like to catch up, you can check it out here. Yumvelope comes in a hefty white box. Let's face it...weight means everything when we're talking snacks! There were seven items in the June box, one of which is a real star....I'll get to that in a minute. My box contained a nice assortment of savory, sweet and salty snacks plus one body care addition, an unexpected treat. The explanatory card tells a little about each item, gives its retail price and website where you can obtain more. There was a big 2 oz. bag of "Savory Masala Popcorn with Papadums" by Masala Pop. This is further described as small batch Indian spiced popcorn with traditional Masala spices with lentil chips. I was a little wary of this but it seems to be just regular popcorn with a peppery type seasoning. The spices used are garlic, red chilies, mustard seeds and turmeric. And, oh yeah...."papadums" are lentil chips. I could do with less heat but this was pretty good. There were two items from McCabe's; a package of "True Original" granola and a "True Original Bar" granola. These are hand baked in Ohio from all natural ingredients. I haven't tried these yet but they are the perfect "to go" size. There seem to be a LOT of pistachios in subscription snack boxes. They take various forms and are seasoned in different ways but I generally like them. This month, Yumvelope included a 2.25 oz. box of pistachios from The Gilded Nut Snack Co. These are coated in cold pressed extra virgin olive oil, then tossed with sea salt and cracked pepper. If you're interested in these, you can get them directly from gildednut.com. Use the code yummy to save 20%. There is an energy bar from the Bearded Brothers in Austin, TX. This is called "Radical Raspberry Lemon". They modestly claim that it's the best tasting energy bar on the planet. I will be the judge of that...ha! The unexpected item this month is a tube of Honey Body Wash from Savannah Bee. This one is in the scent "Orange Blossom" and cleans and exfoliates. I wanted to give it a sniff but it's so tightly sealed that I can't get it open. Will seek assistance then come back and update. I do like getting a non-food item in my Yumvelope. As far as I'm concerned, the piece de resistance in this box is the Madecasse Salted Almond Dark Chocolate bar. This is made with 63% dark chocolate (just the right intensity), sea salt and roasted almond nibs. This was made from scratch in Madagascar which claims some of the most flavorful cocoa in the world. Yes, yes, yes!! So that's everything in June's Yumvelope. The contents are definitely worth the $21 price. This is a subscription that I think is worth extending to the six month subscription level, at which you can get an extra free box. If you'd like to try Yumvelope, use the code lonestarshopper for a 20% discount off your first month. 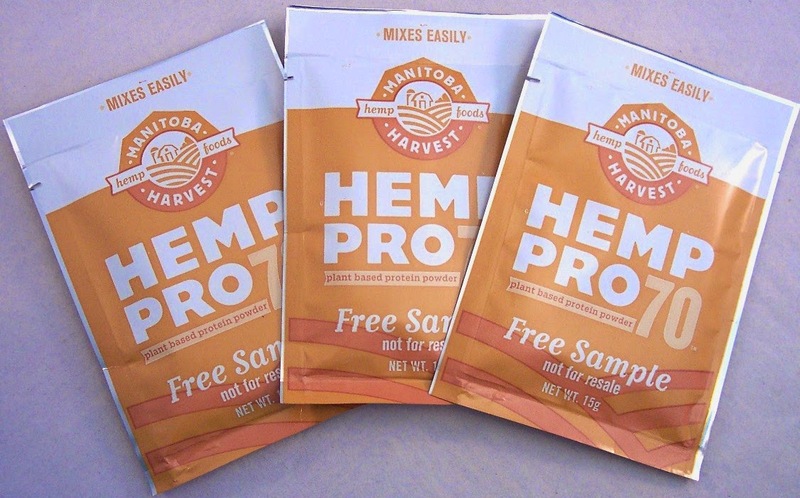 Try some new and tasty all natural snacks and see what you think!